The Barceló Cáceres V Centenario is located in Cáceres (one of Spain's major cities that was declared a World Heritage site by UNESCO), in the heart of 'Los Castellanos' residential area. 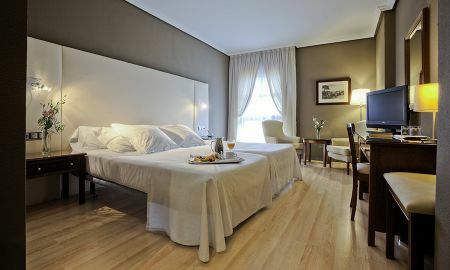 The hotel's fortunate situation allows visitors to quickly explore the treasures of this city whose origins date back to the Middle Ages and Renaissance. The comfortable rooms offer all modern conveniences to enjoy a perfect stay, such as free Wi-Fi connection 24/7. The hotel is surrounded by lush gardens creating a kind of shelter and a welcoming atmosphere. The swimming pool contributes to offer a touch of additional luxury to this stunning accommodation. Barceló Cáceres V Centenario is an excellent hotel for business travellers as it offers fully equipped conference rooms for up to 400 visitors. A covered car park is also available, which is able to accommodate tourist buses. 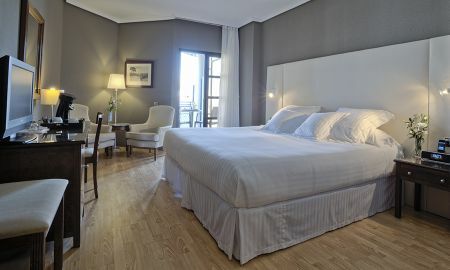 Barceló V Centenario rises in Cáceres, Spain, a few steps from the main bus and train stations and very close to the city centre. The Congress Centre is 1.5 km away. Talavera de la Real airport is just 100 km from the hotel.